" As an 81mm mortar forward observer (FO), I served in combat on/or forward of the MLR at various locations calling in supporting mortar fire. " Having joined the Oklahoma Army National Guard unit 19 June 1947, my enlistment was up 19 June 1950. As a staff sergeant, I re-enlisted. The Korean War started 25 June 1950. The entire 45th Infantry Division of the Oklahoma Army National Guard (ARNG) had about 8,000 members including many World War II officers and NCOs. It was mobilized 1 September 1950 and sent to Camp Polk, Louisiana. Polk was a World War II camp and seldom used, but the 45th had it usable by the end of September. Selected soldiers were dispatched to various military sites for refresher and or advanced specialized training. The regular Army needed NCO leaders and instructors to finish basic training of the civilians who were to become soldiers for assignment to Korea. Beginning October, I was attached as cadre to the 10th Mountain Division at Fort Riley, Kansas. I reported back to the 45th in January 1951 and was assigned as an 81mm mortar instructor. Extensive advanced training was performed. In March of 1951, the 45th was ordered to Japan's north large rudimentary island of Hokkaido. The 45th boarded troop ships in New Orleans and then the ship went through the Panama Canal and headed toward Hokkaido. We arrived in late April and the troops were taken by train to a small village--seemingly 1700's vintage--named Chitose. Awaiting the troops were army tent cities. The mission of the 45th was to protect the island from Russian or Chinese intervention irrespective of training not yet complete. Later, the remaining 4,000 troops arrived and the 45th was composed of about 14,000 men. Troops mainly lived and trained in the field and might be in camp weekends. I was assigned as an "umpire" with duties of grading and helping the squads, platoons and companies as they performed advanced tactics of attacking "aggressors" (other 45th troops). Other training included such things as live firing of all division weaponry, infantry loading aboard a troop ship, actually climbing down the ship rope ladders into small assault boats, and attacking a beach. My brother, Curtis Raymond Maloy, served in the 179th Infantry Regiment of the 45th at the same time I did at Camp Crawford. We were also in Korea at the same time. Fully trained, the 45th was ordered to Korea for replacing the First Cavalry Division. Christmas dinner was in the snow. Moving in the night, two 45th regiments were on the main line of resistance (MLR) with the third one in reserve. Snow soon became deeper and the wind stronger. As an 81mm mortar forward observer (FO), I served in combat on/or forward of the MLR at various locations calling in supporting mortar fire. Late May, my Company Commander visited my FO position and offered me a direct commission if I would serve another year in combat. I declined. My rotation time came about 15 June and by ship I was through the San Francisco Golden Gate Bridge and on to Ft. Sill, Oklahoma. Having returned home, in the Fall of 1952 I re-enrolled in college, where I pursued a major in business and a minor in speech. I graduated in May 1954. I soon accepted a position with a major petroleum corporation. Also in 1954, I was again offered and accepted a direct infantry commission as a 2nd Lieutenant in the Army National Guard. As an experienced combat infantry soldier, I was assigned as the Company Commander in a rifle company of about 120 soldiers. Many were also combat veterans. A year later, I married Paula L. Hensley on May 22, 1955. I was promoted to 1st Lieutenant and four years later I was promoted to Captain. Another year later, I was transferred to an Infantry Battalion (BN) Headquarters. My assignment was as an Assistant Operations Officer, Nuclear Warfare and Air Officer. Later, as a Major, I was the Battalion Operations Officer. Sometime later, regiments became brigades and the battalion staff as a brigade staff. I became the Brigade Operations and Training Officer in 1974. In 1974, I accepted a position with a major petroleum corporation headquarters in Houston, Texas. Because of frequent travel to several refineries, the DoD assigned me as a non-paying Lieutenant Colonel Mobilization Designee. My military education qualified me for Brigadier General. I retired in 1983. In late 1990, I began providing major advice for the organizing the first Korean War Veterans Association Chapter No. 76 in Houston, Texas. My military awards include the Combat Infantry Badge (CIB), Meritorious Service Medal, and several other awards. Ted Lyle Maloy, Lieutenant Colonel, United States Army, 87, passed away on September 13, 2017 in Texas, due to complications from vascular dementia. 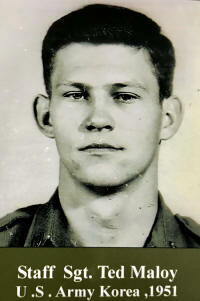 He was born on April 24, 1930 in Clinton, Oklahoma, a son of Ted and Bernice Hardin Maloy. He was a devoted husband, father, brother, and grandfather. Ted grew up in Clinton as "Ted Jr." with his younger brothers Curtis, Lynn and Bob. They loved to get into any kind of trouble possible and were very good at it. Ted spent time at the family farm in Arapaho and summers at the local swimming pool where he was a lifeguard. He became an accomplished platform and springboard diver. 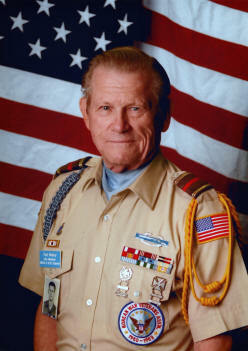 At age 17 after high school, he enlisted in the US Army 45th Infantry Division and was deployed to the Korean War. Having served as a frontline artillery commander and receiving numerous merit awards, he finished his active duty and came back to Oklahoma. He went to college on the GI Bill at Southwestern Oklahoma State University in Weatherford, Oklahoma, and it was there that he met his future wife of 62 years, Paula. Soon after their marriage they moved to Ponca City, where Ted worked for Conoco Oil. Meanwhile, Ted remained active in the 45th Infantry Reserve Guard unit. Ted and Paula had two children, Mark and Kittie, and during summers the family spent vacations visiting relatives in Oklahoma or Albuquerque, New Mexico, where Ted instructed Army reserve training. In 1974, Ted transferred to Houston with Conoco, where they remained. He loved being with his family, whether it was rebuilding their classic Ford Mustangs with Mark in the garage, or listening to Kittie practice the piano. He helped Mark start his lawn care equipment business and, with Paula, spent many years doing whatever was needed at the shop. He could fix anything and it wasn't uncommon to find him in the garage at midnight working on a car engine. Retiring from Conoco in 1985 and from the Army reserve in 1990, he stayed active in the Korean War Veterans Association--Lone Star Chapter, participating in the Color Guard, representing them at numerous military funerals held at Houston National Cemetery. While he accomplished many things over the years, his life was defined by his military service and it was his proudest achievement. Ted will be loved forever and never forgotten. He endured his long struggle with PTSD and dementia with courage and dignity. Ted was preceded in death by his wife, Paula, in January 2017, and by his parents and his beloved stepmother, Zella Maloy. He is survived by his son Mark Maloy (Dianne); daughter Kittie Gugenheim (Kevin); grandchildren Eric Maloy (Mimi), Paige Maloy, Chase Gugenheim, and Jordan Gugenheim; brothers Curtis (Treva), Lynn (Louise), and Bob Haney (Sharon); and brother-in-law Ron Hensley (Wanda). He was buried in the Houston National Cemetery with full military honors. In lieu of flowers, please consider a donation to the Alzheimer's Association or the Wounded Warrior Project in memory of Ted L. Maloy.